Muslims celebrate Eid al-Adha in St Petersburg. (c) Roma Yandolin / Demotix.The Ummah, the worldwide community of Muslims, comprises millions of members across the post-Soviet space. The inhabitants of five republics in Central Asia—Kazakhstan, Kyrgyzstan, Tajikistan, Turkmenistan and Uzbekistan—have enthusiastically embraced their ancestral faith (a mean feat following seventy years of state socialism). Azerbaijan and several regions in Russia, notably the North Caucasus and Volga regions, have seen similar trends. A Pew poll in 2011 estimated Russia's Muslim population at just over 16 million people, or 11.7 per cent of Russia’s total population. By 2030, this figure is expected to rise by 13 per cent. Russia's capital alone is home to over two million Muslims, and labour migration from the periphery of the former Soviet Union has led to large Muslim communities in many of the country's regional cities. Designated as one of Russia's four 'traditional religions', Islam matters. Yet so does the post-Soviet legacy. For many Muslims in the region, Islam can often serve as a marker of ethnic difference—as in Bashkortostan or Tatarstan—rather than a guide to daily life. The state atheism of the Soviet Union severed many links to the religious practices of the past, though certain customs and festivals such as circumcision and Muslim-origin given names persisted. Meanwhile, the post-war introduction of 'spiritual management' in the Soviet Union paved the way for institutionalised Islam. Indeed, the leader of Chechnya Ramzan Kadyrov has declared himself a defender of 'traditional Muslim values', instituting a public dress code for women in flagrant violation of the constitution of the Russian state to which Chechnya appears to tenuously belong. Religion, whether Orthodox Christianity or Islam, is once again a source of and object for the legitimisation of state power. Implausible thought it would now seem, the first constitution of self-declared independent Chechnya in 1992 made scant reference to any religious role in the state. Similarly, while Muslim mujahideen from Afghanistan served on the battlefields of Nagorno-Karabakh, facing Soviet-made tanks freshly painted with the occasional cross, the conflicts were largely national in nature, facilitated by the Soviet state's institutionalisation of ethnicity and allocation of resources to defined national territories. Few serious commentators would claim a religious motivation to the Nagorno-Karabakh or Ossetian-Ingush conflicts, whatever the confessions of the warring sides. The conflict in eastern Ukraine has propelled Russian ethnic nationalism to new heights of legitimacy in the public sphere – and in multicultural, multiconfessional Russia this is a dangerous game to play. Two of Russia's most influential regions—the autonomous republics of Chechnya and Tatarstan—have taken very different paths towards maintaining degrees of quasi-independence from Moscow since independence, despite Putin's moves to centralise. Can Russia's leaders please the nationalist sentiment they have unleashed while assuring Muslims of their continued place in a multi-ethnic society? The shadow of Islamic State has also been cast over the Caucasus and Central Asia, although data show that—sensationalist media reports aside—radicalisation in the region has been exaggerated. Russian-speaking militants from the region are fighting with IS in Iraq and Syria, most notoriously Tarkhan Batirashvili, a Georgian Kist operating under the nom de guerre Abu Umar Al-Shishani. But beyond several figures in the IS leadership, our imaginations are free to run wild following the absence of accurate numbers on who is operating where. Tatar Muslims celebrate the opening of a new mosque in Bolgar, 2012. Tatarstan, Russian Federation. Photo: Maxim EdwardsIn the 2000s, the US War on Terror gave leave to the region's autocrats (among other leaders) to suppress civil liberties under the guise of counter-radicalisation. It is a potent tool in the wrong hands: collective judgement of marginalised Muslim communities cannot contribute to their integration and acceptance in post-Soviet societies. Instability has also risen in Tajikistan, where Emomali Rahmon has censured Central Asia's sole remaining legal Islamic party, reneging on the peace agreements from the country's vicious civil war in the early 1990s. While Russian involvement in Syria may, as our contributor Greg Forbes writes, be an attempt to 'preserve the key to the hallowed halls of international relevance', the recent military engagement in the Middle East has only raised the significance of Russia's ties to the wider Muslim world. With Russia's majority Sunni Muslim population, there are concerns that Putin's intervention on behalf of Assad, seen to represent the Alawite Shia, could backfire in the form of further alienation. After the collapse of the Soviet Union, the Russian state's search for its rightful place in the world— or wrongful, depending on taste—has inched towards the subaltern in the Muslim world. Azerbaijani-Russian political activist Heydar Dzhemal, for example, held a 1999 conference to call for a strategic union between Orthodox Christian and Islamic civilisations against American imperialism. A handful in the Muslim world have heeded the call. Others – given Russia's actions in Chechnya in the First and Second Chechen Wars, and more recently against the Crimean Tatars – have been less convinced. The Tatar Muslim national communist Mirsaid Sultangaliev once hoped that the Soviet Union would serve as a 'red lighthouse' for the oppressed Muslim masses of Arabia, Persia, and Turkey. It would seem that Russia must convince its own Muslim population of the veracity of its political project first. In recent months, oDR has looked at several themes concerning the Ummah in the post-Soviet space. These have examined the Kadyrov regime's attempts to combat IS recruitment, the decline of the Caucasus Emirate with the rise of Islamic State, the place of ethnic Georgian Muslims in Georgian society, traces of the vanished Muslim communities of Armenia, and asked whether Islamic state is really in Kyrgyzstan. In 2012, we ran a series of articles on women's lives, tradition and patriarchy in the Muslim-majority regions of Chechnya, Dagestan and Ingushetia in the Russian North Caucasus. 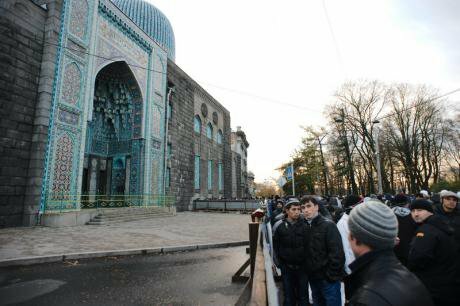 1) Russian journalist Nadezhda Kevorkova muses on the political ramifications of the reopening of Moscow's central mosque (translated and republished with kind permission of KavPolit). 2) Azerbaijani blogger and journalist Arzu Geybulla—on Islam in Azerbaijan—asks whether the Aliyev regime is playing with fire in attempting to simultaneously co-opt and repress religious life. 3) A Crimean Tatar journalist uncovers how Muslims on the peninsula have come to terms with the realities of Russian annexation and the resulting schisms in Crimean Tatar Islamic institutions. 4) Franco Galdini investigates the diversity of Islamic life in Kyrgyzstan, a country which has witnessed an Islamic revival since the late 1980s. Against an apparent extremist threat, is Kyrgyzstan’s weak state the real problem facing the country? 5) Researcher Inga Popovaite reflects on the need for informed CVE strategies in Georgia's Pankisi Gorge, the origin of several Chechen and Kist fighters with IS. Does sensationalist media coverage only alienate these communities and compound the problem? With Ummah, we aim to provoke informed comment and analysis on Islamic life in the post-Soviet world. If you are interested in taking part, get in touch.